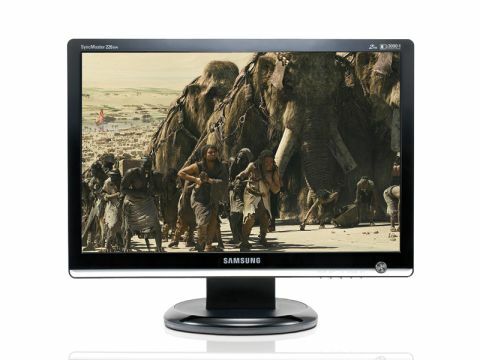 The Samsung SM226CW got off to a good start as soon as it came out of the box as it looks great. The shiny black bezel contrasts with the matt-silver strip running across the bottom of the display and the aluminium power button looks very smart. Samsung uses a blue LED to illuminate the power button, it looks really cool. The flying start came crashing to the ground when we found the picture looked strange on an analogue connection. We had the Samsung display driver correctly installed and the resolution was set to 1680 x 1050 pixels, but the image was stretched to such an extent the icons in the system tray vanished off the edge of the screen. Even when using the Auto Adjust button it made no difference. However, switching from analogue VGA to digital DVI transformed the Samsung, as we now had a pin-sharp image that was, more importantly, the correct size. Colours looked vibrant and strong without being overpowering in Normal mode and we felt no need to make any adjustments beyond a tweak of contrast and brightness. However, if you like a variety of settings for different occassions, MagicBright offers are Custom, Text, Internet, Game, Sport, Movie or Dynamic Contrast and, as the OSD can only list four items at a time, they are spread over two pages. That seems over complicated and we were unable to see any difference between Game and Movie. Our advice is you should leave MagicBright alone to avoid unnecessary confusion, but of course that's something of a moot point as you won't consider buying the SM226CW unless you have a digital output on your laptop.